To what are you loyal? Are you loyal to the truth and humankind, or are you loyal to your friends and institutions? 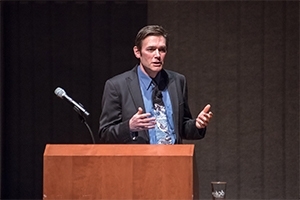 These are the questions Marc Edwards posed to the American University environmental science community during a presentation at AU's Abramson Family Recital Hall on February 8. Often referred to as the “plumbing professor,” Edwards spent most of his career studying the waterworks of American cities. Before investigating the Flint, Michigan, water crisis, Edwards gained national attention for exposing high lead levels during the 2001–04 DC water crisis. In 1996, he was awarded a White House presidential faculty fellowship, and in 2007 he was named a MacArthur Fellow, based on his vital role in ensuring the safety of drinking water and in exposing deteriorating water infrastructures in America’s largest cities. The AU Department of Environmental Science hosted Edwards’s visit to American University. His presentation focused on how government science institutions went to great lengths to conceal critical information about the toxic levels of lead in Flint’s water supply. In 2015, Edwards was contacted by a mom of four children living in Flint. She was concerned about the water safety in her home. Edwards traveled to the city to conduct a study that uncovered high levels of lead in the city’s tap water. The city’s water source had been switched from the Detroit water system to the Flint River in 2014, exposing more than 100,000 people to high levels of lead. CAS Leadership and Ethical Development Program students Deanna Buba (BA environmental studies '21) and Evan Steinberg (BS statistics ’21) reflected on Edwards’s presentation. Buba said, "As an environmental studies major, I was interested in his call to action relating to loyalty. In Flint, the community doesn’t trust its government or its water, even though the problem was eventually corrected. The water crisis left an imprint of distrust throughout the community." At the end of the evening, Edwards returned to his original question in the context of Flint. “What type of world will we live in if we don’t honor loyalty to the truth and humankind, before loyalty to our institutions and our friends?” he asked the audience.